Prepare the quinoa: Bring the rinsed & drained quinoa, 1 1/2 c. water and salt to a boil in a medium saucepan. Reduce heat, cover and simmer until the water is just absorbed and the quinoa is tender, 15-20 minutes. Spread the quinoa out onto a large, baking sheet and allow to cool for about 20 minutes. Transfer to a large bowl, set aside. Make the dressing: In a blender, add 1/4 c. of the toasted cashews and 2 T. of the toasted sesame seeds, along with 2 T. of the canola oil. Blend until creamy. Add the remaining 2T. canola oil, lime juice, 2 T. water, soy sauce, sesame oil, chili garlic sauce, sugar, ginger and garlic, blend until emulsified. 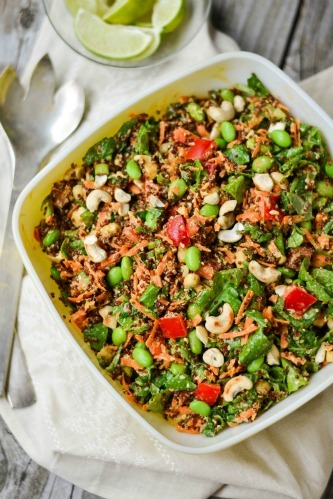 Finish the salad: To the quinoa, add the edamame, bell pepper, carrots, scallion, kale, the remaining cashews, sesame seeds and the dressing. Mix well to combine. Serve with lime wedges, if desired. 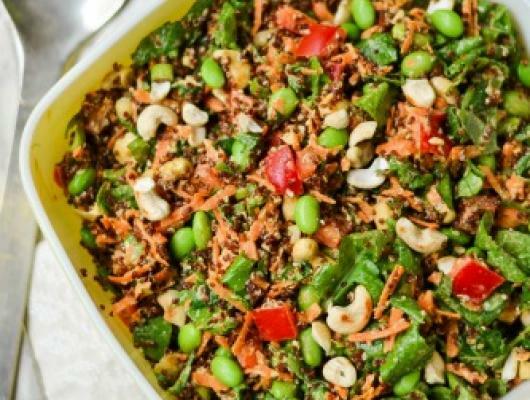 This Asian-inspired quinoa salad is packed full of nutrient rich ingredients, is vegan, gluten-free and satisfyingly filling!